Home Entertainment Bollywood Bhaiaji Superhit movie trailer review and story !!! Bhaiaji Superhit is upcoming Indian action comedy film. This movie is directed by Neerraj Pathak and features actor Sunny Deol, Preity Zinta, Ameesha Patel, Arshad Warsi and Shreyas Talpade in lead roles. Movie Bhaiaji Superhit will be released on 23rd Nov 2018 after two times rescheduling from June and Oct’18. Music Copyrights were taken by Zee Music Company. Bhaiaji Superhit went through many controversies and it taken completion time of more than 7 years ( 2011 to 2018 ) due to financial issues. Initially budget declared was 24 cr. Indian rupees which increased to 40 cr. by additionally joined producer Chirag Dhariwal, As Chirag Dhariwal is more confident on the story and action comedy exist in the movie. Chirag claimed more earnings from the release of this movie. Story begins as a greatest don of Banaras ( Varanasi ) played by Sunny Deol, dreams to enter in Cinema and approaches Big Screen. The entire movie is surrounding this phase that Bhaisahab Dubey wanted to be an Actor. At the moment, Arshad Warsi and Shreyas Talpade dive into the drama as Director and Writer. With the help of Arshad Warsi and Shreyas Talpade, Sunny Deol begins shooting, and the actual comedy, drama begins here. The similar story has been already shown in big screen, in movie Welcome, where a gangster wanted to become an actor, that all shown in comic way and this idea attracted the audience, Producer Chirag Dhariwal hoping the same to gather the audience on its Action, Comedy and drama. This movie is made for an entertainment there is no suspense or twist in the story. 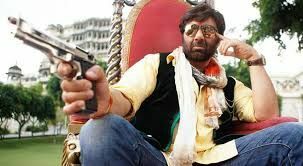 Audience will be around this subject that in the movie sunny Deol wants to become an Actor and there are some concerns with other who block the way. To see the Action of Sunny Deol and Comedy of Arshad and Shreyas, probably audience will move to theatres. Maximum shooting happen in Rajasthan, Udaipur. Movie produced under label “Zee Studios”. Movie Bhaiaji Superhit has one romantic song – Do Naina . . . Sunny is hoping a grand success from this movie Bhaiaji Superhit, As the few recent movies i.e. Poster Boys, Yamla Pagla Deewana phir se, Mohalla assi was not captured the expected market. What do you think, Can Sunny Deol make it success story ? In Comments section, Please do let us know your comments below. Next articleRobot 2.0 movie review and Prediction on Trailer : Get ready for Full on action this weekend !! !